We've invested a large portion of this year listening to your feedback, and we've been making some exciting improvements at aspecialtybox.com. 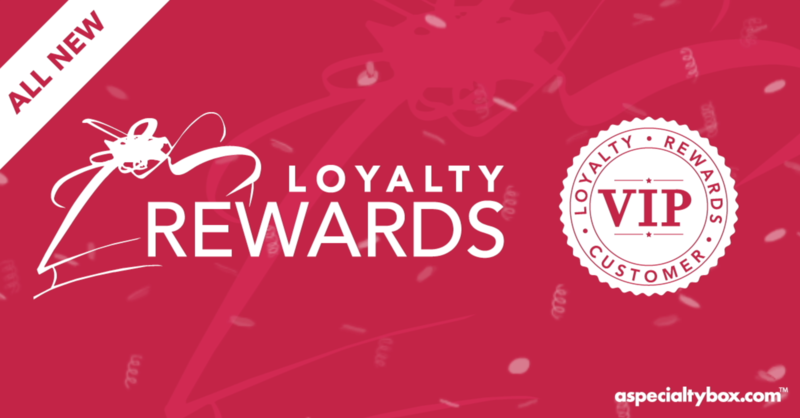 One of the first things is our improved Loyalty Rewards program. There are now more ways to earn points and they are easier to redeem. There is a button on each product page that shows the number of Loyalty Reward points required to redeem the item – and you can redeem directly from that page. To celebrate the launch, we have a special promotion. For a limited time, EARN BONUS POINTS with select packaging purchases. * For every $100 spent, earn an additional 10 Loyalty Rewards points. Plus, now you earn points by creating an account on aspecialtybox.com and for leaving product reviews! Shop aspecialtybox.com using your account. Redeem Loyalty Rewards points on your next order. Check your balance now by logging into your account, and scrolling down to the My Rewards section and clicking View Details. We're excited to provide you with more ways to earn Loyalty Rewards points even faster. Please let us know if you have any questions about our updated program. You can email us at asb@aspecialtybox.com or visit our Loyalty Rewards FAQ page. Also, if you haven't had an oppurtunity to provide us with feedback in this quick 1-minute survey, click this link. * Loyalty Rewards Promotion valid from October 12, 2017 through 11:59p CST, October 25, 2017. Points can be redeemed on future orders of any product. Heart boxes are not eligible to earn additional bonus points during this promotion. Account creation points only valid for new accounts.